I am going to Mumbai this weekend. Towards this, I have expended a lot of effort, and quite a lot of cash as well, as I am going on my own cost and not at the cost of the Ministry of Health. I hope to land in Mumbai at or around 9:00 A.M. on Friday, 4th May, 2012. My journey will begin tomorrow though, i.e. on /tuesday 1st May 2012. 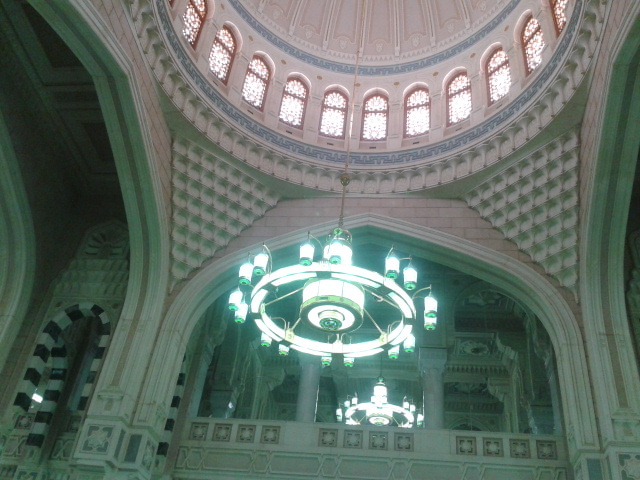 From Al Muweh, I will go to Ta'if, where I hope to pick up my passport. 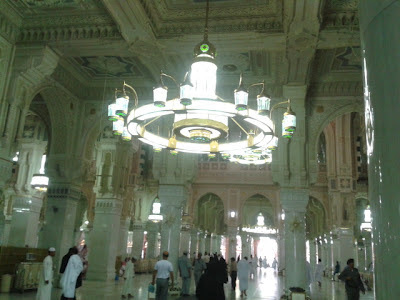 Thence, to Mecca for a pilgrimage of circumambulation only; and finally, to Jeddah, from where I will board the flight early Friday morning (1.30 A.M. Saudi time). I will be staying in Mumbai till the end of May, and will return, Inshallah, on the 1st of June 2012. Those who are in Mumbai, do call me on my cell number in India (+919821***248) or on my email id drtaher@gmail.com. I would be pleased to get in touch with you. I am writing this a few days after returning from Mecca. The interesting things I saw in this city on this visit go beyond the normal stuff that I saw in my two previous visits. On the first visit in November, I was in the company of my cousin and his family, and the visit was all too brief - just a few hours. 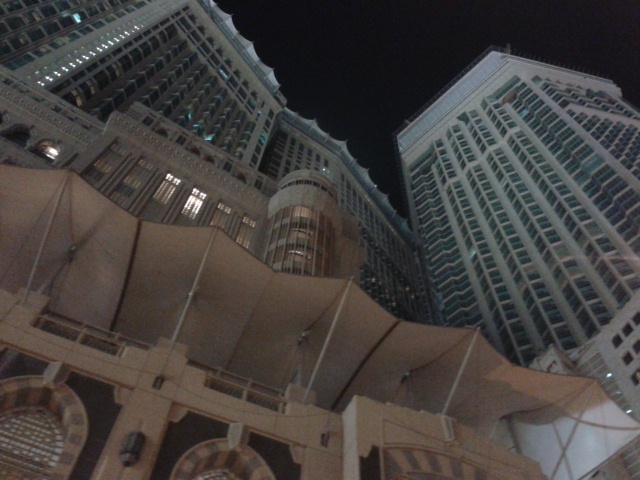 On the second visit, I discovered the malls and the diverse crowds in the city, apart from losing my slippers. This time, though, I had more time on my hands, and I intended to explore the city as if was a tourist, not just a pilgrim. I had already explored some parts of the city on Tuesday and Wednesday, but while my mind was tense for the forthcoming exam on Tuesday (ultimately, I cleared the exam on Wednesday) and was pre-occupied with the Umrah on Wednesday, I was totally free from the later part of the evening on Wednesday (i.e. yesterday) and the half of Thursday that I spent in the city. 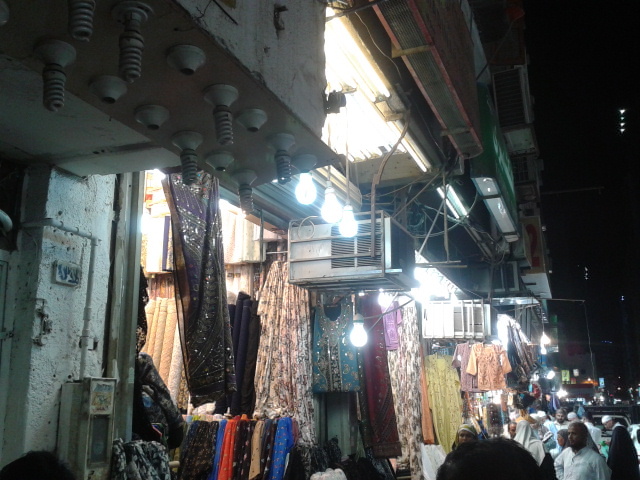 On Wednesday evening, I explored the local bazaar down the street where my hotel was located. 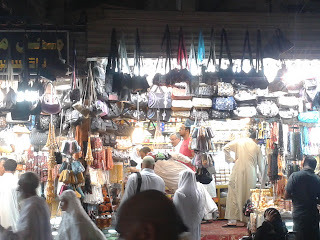 There are hundreds of small shops that sell stuff ranging from clothes, abayas, handbags, jewellery, religious books .... to utensils, suitcases, travel paraphernalia, the things that pilgrims most need such as cheap slippers (to wear inside the Haram), nail-cutters, waist belts (with pockets to keep cash and other important stuff - for the males who have to wear only the two piece white cloths known as the >>>>), dry fruit, eateries with broast chicken, rolls, sandwiches, cold drinks, tea and a few other staples, and what not. All these shops are located on both sides of the narrow street, and almost all the buildings atop these shops are ... you guessed right ... hotels. Some are seedy and others are huge 15-20 storey towers. The interesting thing about the shoppers here is that they come from all parts of the world; some are Umrah pilgrims and have their heads shorn and wearing whites, some are Africans with colourful long dresses, some, Indonesians with their small traditional caps and serious faces, some, Indians/Pakistanis/Bangla Deshis, with their usual attire of shirts and trousers, or tee-shirts and casuals - jeans, for example. Women are usually covered, except for Indonesians and South Asians, who keep their faces open. 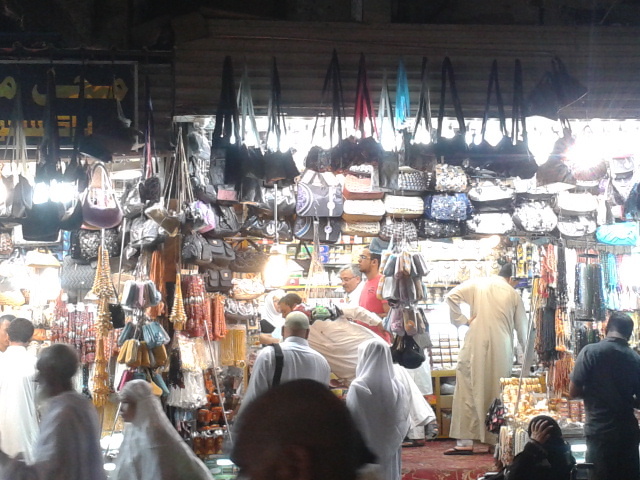 The photos here show you how close these markets look to the ones at Bhendi Bazaar in Mumbai! Really, it was that colourful. 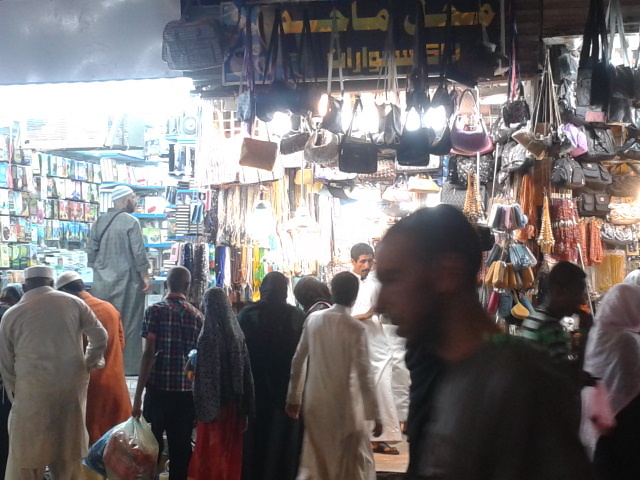 I was stunned to see the lively nature of these shoppers and shop-keepers. I moved on to the Haram area, and there, too, there were hundreds of people either moving toward, or away, from the Holy Mosque. On the way, they stopped to eat, chat, shop, browse and enjoy just like tourists anywhere else. I went in to the shop shown here and enquired about the price of gold. For 21 Kara gold, the price was SR 2000/= which translates to INR 27000. This is a bit steep, I think, because the price of gold in India is around the same for 22 Karats. Be that as it may, wise people believe in taking gold from here to India as it is supposed to be "pure" and unadulterated. I don't know about the truth in this. By the time the crowds clear, it must be past midnight, but even so, people keep streaming in and out throughout the night. 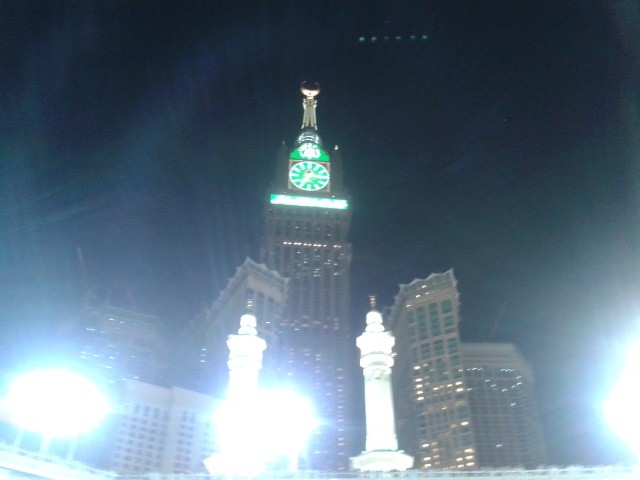 The Haram is open for pilgrims 24X7,there being no downtime, as maintenance continues night and day: cleaners with their automatic mop cars, vacuum cleaners, etc. keep working all the hours of day and night. 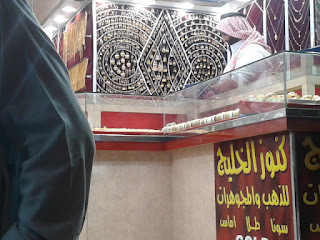 From the market, I moved on to the area around the Haram. 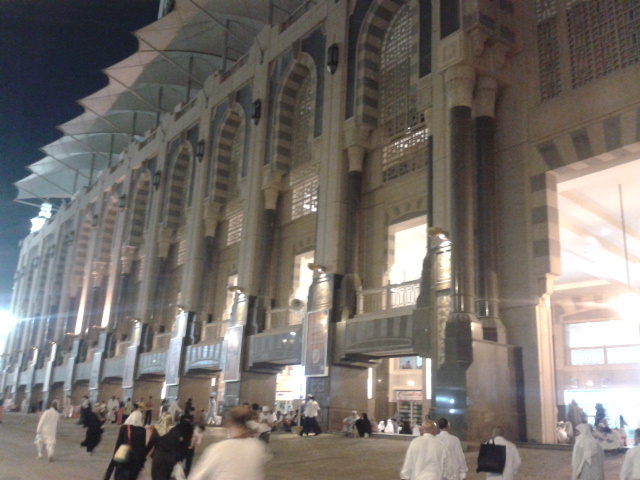 Here, one can see hundreds of pilgrims either moving towards, or away, from the Holy Mosque. Most have gone for evening prayers and are returning at about half past eight, while, by nine or so, most are returning from the mosque and making their way to their hotels. On the way, they will (as I did) stop to chat, take pictures, eat snacks or drink tea or soft drinks, or stop to buy stuff that their hearts desire. Many will, as I did, drop inside the malls that line the tall -hotels and browse at leisure. Some will end up buying expensive stuff, while others will enter the supermarkets to buy chocolates, toiletries, and what not. Still others will take dinner at one of the food outlets on the ground floor, or make their way to the food court on one of the upper floors, where they will retire to stuff themselves. Inside the Haram, night shots show the beauty of the interiors of the mosque from the King Fahd entrance. Here are some pictures that will take your breath away. 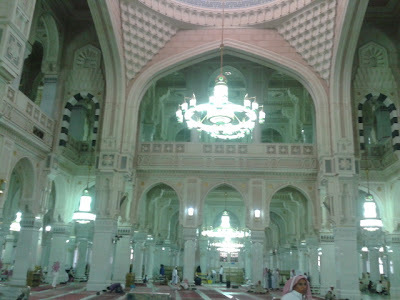 Imagine that there are several of these "halls" in just one quadrant of the mosque surrounding the Holy Kaaba, and you will begin to understand the huge, huge structure that comprises of the Haram area. 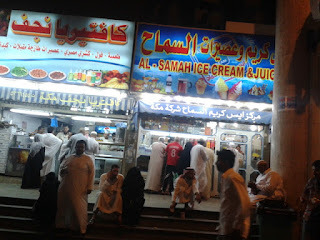 After a night prayer and tawaf, I stopped at a local restaurant for dinner, and finally returned to the hotel room to sleep.